There is an ancient theory that the deeper we look into the nature of reality, the simpler it gets. The Greek philosopher Democritus (c. 460 – c. 370 BC) is often given credit for being the originator of the idea that matter consists of atoms, though his teacher and mentor Leucippus should probably receive that honor. Democritus, however, developed the concept of atoms into a well-developed theory of the nature of reality. Atoms are indivisible and indestructible. Atoms have always existed, and always will exist. Atoms come in an infinite variety of sizes and shapes. Atoms are always in motion. In between the atoms there is only empty space. Democritus believed that all things, including subtle phenomena such as light, consisted of these indivisible, indestructible atoms. 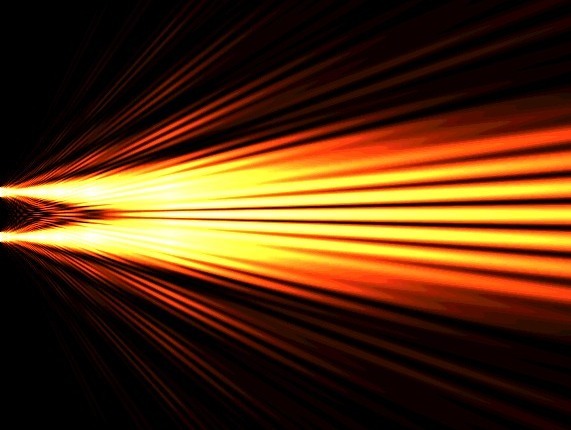 Fast forward nearly two and a half millennia to today, and we’re still trying to figure out whether the phenomena we see around us in this material world consist of some sort of fundamental particles, or whether reality is more of a wave-like thing. Sometimes it looks like everything is made of waves; other times it looks like everything is made of particles. And in some famous experiments in which a beam of light is passed through two slits, light seems to behave like both waves and particles at the same time. In modern physics, our general experience is that as we look deeper and deeper into the nature of reality, instead of getting simpler, things only gets more complex. Emanuel Swedenborg (1688–1772) offers some insights and theories that may help to put “wavicles” and the other strange phenomena that occur at the borders of physical reality into a more spiritual and universal perspective. Swedenborg began his adult life as a scientist and ended it as a theologian. As he saw it, science and theology are not in conflict, but form a unified whole. First, let’s look at the question of whether things get simpler or more complicated as we look deeper. Modern scientists are still searching for a particle that could be the fundamental building block of reality. The latest contestant for that honor is the Higgs boson. In an attempt to verify the reality of this theorized subatomic particle, the European Organization for Nuclear Research (CERN) spent nearly $9 billion (7.5b Euros) building the Large Hadron Collider (LHC) along the border between France and Switzerland, near Geneva. A few months ago, the LHC tentatively confirmed that the Higgs boson does indeed exist. Yet as the increasingly expensive experiments in physics continue, instead of leading us to a fundamental, irreducible particle or force that is the basis of the universe, reality only seems to get stranger and more complex. According to Swedenborg, that’s because reality does not, in fact, get simpler the deeper we look. Instead, it keeps getting more complex. And ultimately, it gets infinitely more complex. Because the “fundamental particle” of the universe is none other than God. And though God is one in number, and in that sense is a “simple” entity, God also encompasses infinite states of reality. That may seem impossible to grasp. In fact, given that our minds are finite, it actually is impossible to fully grasp. But if we consider that the human body consists of about 100 trillion cells, we can begin to get some idea of what it might mean for God to consist of an infinite number of divine “cells,” or states of reality. During the earlier scientific and philosophical period of his life, Swedenborg proposed a theory of the formation of matter that involved successively more energetic and complex particles stretching all the way from solid matter through various levels of reality, and ultimately originating in God. The general idea behind this theory, developed more fully during his later, theological and spiritual period, was that everything in creation is a slowed down and limited expression of the infinite nature of God. This, according to Swedenborg, is why things just keep getting more complex the deeper we look. If Swedenborg is correct, then even if we were to build a particle collider large enough to encircle the entire earth, we would never find a simple, fundamental particle that is the building block of all nature. Instead, we would simply keep finding more and more levels of complexity until we reached the limits of what physical instruments can observe. If we accept the idea that reality is a multi-level affair that keeps getting more complex and more energetic the deeper we look, then we humans will never run out of new discoveries and new phenomena to investigate. The fact that God is infinite, and has created the universe in the image of the infinite, ensures that we will never know everything there is to know about reality. There will always be more to learn. That learning will not simply pile up more and more information, but will periodically jump to whole new levels of reality. Now let’s take a spiritual look at the ancient tension between reality as particles and reality as waves. Most scientists, of course, are looking for physical laws to explain the wave-particle duality and other strange, anti-intuitive phenomena that occur in nature and at the borders of our understanding of physics. And there is nothing wrong with digging deeper and deeper into physical reality. If Swedenborg is correct, and the physical universe is an expression of the deeper realities of God and spirit, then scientists will continue to discover a coherent, law-abiding physical universe no matter how deeply they look. However, if we accept the reality of levels beyond the physical, we can gain a deeper appreciation of the meaning of such physical paradoxes as the wave-particle duality. Let’s start right at the top of the ladder of reality. wisdom, which is the form of God. These two together result in all of the power and activity of God. So one simple, abstract way we can think of God is that God consists of love, wisdom, and action. From the core love-wisdom duality of God, everything else in the universe flows. Therefore if we look at any spiritual or physical phenomenon, we will find that it, too, consists of a duality that functions on its own level in the same way that love and wisdom function in God—and that those two inseparable elements combine to produce all of the functions, activities, and effects of that phenomenon. Are you getting some idea of how this relates to “wavicles,” or the wave-particle duality? From a spiritual perspective, the reason physical matter seems to function both as a wave and as a particle simultaneously is that waves are a physical expression of love, whereas particles are a physical expression of wisdom (or truth). Waves are a smooth, continuous, connected phenomenon. This partakes of the nature of love, which holds all things together. Particles are a discrete, distinct, separate phenomenon. This partakes of the nature of truth, which distinguishes things from one another. Together, the wave and particle aspects of physical matter as we now understand it combine to produce all the phenomena that we observe with our physical senses. In other words, the wavicles now theorized by modern physics, and all of the effects that they produce, are yet another expression of the nature of God—who consists of an infinite union of love and wisdom, resulting in the many and varied phenomena of spiritual and physical reality. Is that enough brain-bending for now? Yes, yes, I know . . . this is all very abstract. In the next article, “Containers for God,” we’ll get a little more concrete: We will look at how the love-wisdom duality of the universe makes it possible for us to have a personal relationship with God, with one another, and with the universe in which we live. One of the things I realized a long time ago is all of the miracles in the Bible could be done by someone with present day knowledge and equipment. I feel that the idea of another race from another planet having invaded cannot be discarded. Also, no matter what explanation that is given for the beginning of the world or the universe, God, Big Bang, or whatever, Nothing can explain God. He was , He is, and He is to come. So my problem is still not solved. Thanks for stopping by, and for your thoughts. What problem is still not solved? The problem of where things come from. Ok, so they come from God. So where does God come from? Nowhere, he was always here. Problem. If something exists, then it couldn’t have come out of nothing. There had to be something where it all started–something that was just there, existing, before anything else came into existence. That something is God. I’m not saying it’s easy to understand. But if you think about it, it all had to start with something, didn’t it? Hi Lee and aflanders to chime in with a few thoughts: I agree with Lee that it is impossible for something to be made out of nothing, and to add, which makes our seeming physicality divinely inspired and at the same “time” one with our creator. Weather we choose to acknowledge it or not is actually irrelevant it just is. This is a blow to our egos and our self-importance but once accepted our relevance in this world is reinvigorated by our connection to God. Thanks for stopping by, and for your thoughtful comment. I would only add that once we have come to an awareness of the nature of consciousness–which is on the level of our head, or understanding–we must then engage our heart, acting from love for our fellow human beings, in order to achieve that “catapulting through all problems, limitations, and human endeavors.” The head alone won’t get us there. But head and heart together will, when we act upon their promptings and guidance. I have discussed at http://blog.beginningtheisticscience.com/2013/08/images-and-correspondences-of-god-in.html the question of correspondences of processes in quantum mechanics. I come to a slightly different conclusion. Thanks for stopping by, and for the link. Based on a fairly quick perusal of your article, I think you and I are looking at at it from different angles, and focusing on a different specific set of phenomena, hence the different conclusions. My article focuses specifically on the wave-particle duality, whereas yours appears to me to focus on what we would commonly call a particle, and its properties and effects. I say this because your final set of numbered points, which seem to offer your general conclusion, refer to the properties and activity of a particle. My understanding of the “trinity” of love, wisdom, and action is that it is fully scalable, meaning that any object or phenomenon, or any set or subset of objects and phenomena, can be analyzed as to its love, wisdom, and action components even if that particular object or phenomenon may function as only one of the three in relation to other objects or phenomena. As an example of this, in the human body, the limbs, hands, and feet in relation to the whole body are on the level of action, since they carry out the intentions and directions of the mind and heart. However, if we consider an arm, a leg, a hand, or a foot on its own, it contains the analogs of all three elements–love, wisdom, and action–within itself: it has substance, it has form, and it has function. This means that if we analyze what is commonly called a particle, as you did in your piece, we will find that it has aspects that correspond to love, wisdom, and action. But if we put a particle in relationship with a wave, as I did in my article, then the particle will function as one part of the “trinity” while the wave will function as a different part. On that scale, I believe the particle functions as the “wisdom” part, while the wave functions as the “love” part, and the observable phenomena produced are the “action” part. In other words, I don’t think there is any essential conflict between your article and mine. They are simply looking at a somewhat different subset of phenomena, from somewhat different angles. I completely agree that any good description of these things should be ‘fully scalable’, as you say. That is, that the “trinity” pattern can be seen on both the largest scale, and again when we look into all the details. You describe this well. Which is bizarre. Swedenborg describes thought as a wave, which was confirmed by science in the 20th century. The wave is the thought, but when it becomes a particle it becomes the realized potential, the operation. Here, you will have to add something, to avoid giving the impression that electrons have no substance or weight, and that protons and neutrons do not have any form. Having said all that, an issue I have with the whole debate of quantum mechanics in particular and modern physics in general is that it seems, from my scientific layman’s perspective, to deal greatly with energy, but to fall apart when it comes to substance. Both are analogs of love. But it seems to me that energy is not the same as substance. To put it in crude terms, substance means there is some sort of “stuff” that any given reality is made of. What is that “stuff”? I know that Einstein’s famous equation equates matter with energy. However, it seems to me that energy is taken as the more fundamental, whereas matter is taken as the derivative. That’s where I have a problem. How can there be energy if there is no substance on which it works, and from which it is based? Jumping all the way up to the divine level, my sense is that divine love is primarily a substance, and that the energy that we also think of as love emanates from the substance of love. But modern physics seems to want to resolve things into “pure energy” (Spock’s famous quote) at the deepest level. Do you see reality fundamentally resolving into some substance that is its ultimate basis, or do you see energy as the fundamental basis of reality? Or something else? I think we have to distinguish classical physics from quantum physics, concerning your two most recent posts. By ‘classical physics’ I include special and general relativity. In your first reply, you say you want to consider ‘waves’, whereas I considered ‘particles’. In you second reply, you say you want to avoid making everything ‘pure energy’. But it is only in classical physics that we have ‘waves’ as such. Maxwell’s theory of electromagnetism, for example, describes elastic and magnetic fields, and said that these were some kind of wave or field without saying what they are waves ‘of’. Many people of that time thought they must be waves of some ‘aether’, but that option disappeared with special relativity. And it is only in classical physics with special relativity that we have ‘pure energy’. Special relativity states that there for every mass ‘m’, there is ‘rest energy’ E=mc^2. It perhaps looks like particles are just clustered collections of ‘pure energy’. However, in quantum physics, we have NEITHER ‘waves as such’, NOR ‘pure energy’. The electromagnetic waves, for example, now become collections of photons, and the wave functions of the photons all add to make the Maxwellian waves. These photons are called ‘virtual particles’, because the they are generated and absorbed in large numbers and not individually detected. Neither in quantum physics do we ever have pure energy, but only energy ‘of’ some specific particle. The particle may be real (where we see its creation or capture), or virtual (when we do not), but there is never ‘energy by itself’, only energy of specific substances. These specific things are in fact small ‘wave packets’ (or your good name ‘wavicles’) which propagate by some ‘wave equation’. But the waves are not classical waves that spread out everywhere in space, but are in fact ‘waves of propensity’ for specific interactions. I believe that all physical things that exist are more truely represented by quantum physics than classical physics. (I will reply soon to your last question, on substance). My answer to this is complicated, and involves several discrete degrees & correspondences. Spiritual things are collections of beings for which spiritual love is the substance. Mental things are collections of beings for which love of thinking (and intention) is the substance. Physical things are collections of beings for which physical propensity is the substance. Then we have to ask what are the physical propensities we refer to in this last claim. I have referred to ‘propensity’ in my previous answers, and by that I refer to tendency of physical things to produce specific effects, whether in measurements & experiments, or apparently spontaneously (in radioactive decays). This propensity is distributed in forms, namely the form of the wave function. This propensity is the substance of the quantum things. I can then go further back, and ask what produced the propensities. This, I claim, is the total energy of a body (kinetic & potential), as described the Schroedinger equation. That means that energy is a ‘prior’ discrete degree, one that generates the propensities. Both energy and quantum propensities are 100% physical. Just a quick note to say thanks for your additional thoughts and input. Plenty of material to stretch the ol’ brain for a while! We should be able to have some ideas from Swedenborg about the nature of nature, but a lot of thinking is required. I’m inclined to think God is One and Whole and indivisible with no beginning and no end, no characteristics and fully unknowable and what our minds conceive will always appear dualistic from our inescapable relativist materialist point of view fully incapable of pure objectivity. We can never have anything for the mind but a conception and never arrive at a fundamental substance capable of reaching or defining the infinite because that would be the end of us, the end of our looking conceiving and naming, and the end of this expression/projection of our self informed by reason or romance. Our continued insistence on proofs that suit our perspective, the need for a developed model that stands everything upright and correct for the betterment of all that ails us, is not our failing or ignorance, but is our nature, our culture, our language. But we always end up defining only ourselves, never God. To my way of thinking this experience is all that it is unto itself and is an end in itself with no effect whatsoever on the Whole. Creation is a contradiction in terms. That anything could ever be separate from God is the fundamental illusion of Maya, the Dream. It is nothing but God. That hard and lonely indifference to our struggles might be too nihilistic for most Western people but for me it eliminates the hubris of putting God or creation into description, and forms the real and only task as the one before me this day, this life, this that I am. I am God as Humanist. There also was a Greek that thought all was water. As long as it’s All, it doesn’t matter what you call it. Thanks for stopping by, and for your mind-stretching thoughts. I agree that God is one and whole and indivisible with no beginning and no end. God is a timeless, eternal being. And we can never know or grasp the infinity of God with our finite minds. However, I do believe that God is expressed and manifested in us and in the created universe, such that we can gain some accurate picture of God, even if it can never fully represent the whole of God. Like a flat photograph or painting of a full-dimensional scene, the created universe, as well as our own humanity created in the image and likeness of God, gives our minds a reasonably accurate picture of God at a level on which we can grasp it. So our connection to God exists in the interplay between the infinite unknowability of God and the expressed knowability of God. Another way of saying this is that I see the universe as panentheistic (God is in everything) rather than as pantheistic (God is everything).